www.docuvoice.com DocuVoice provides targeted Reimbursement Solutions with a key focus on assuring hospitals maximize their entitled reimbursement dollars. These solutions are provided by experienced healthcare business partners DocuVoice has strategically selected to meet the needs of coding, medical necessity and documentation requirements within an acute care setting. Our services include remote coding services and Physician conducted audits. The bottom line is these solutions provide additional hard dollar gains with a significant Return on Investment (ROI). www.hrgpros.com/ HRG is the largest U.S.-based, employee-owned revenue cycle management company in the nation. Founded and focused on quality and delivering exceptional customer service, HRG develops customized solutions to fully optimize medical revenue cycles for partners of all sizes across the country. Health Information Management (HIM), Patient Financial Services (PFS), Consulting and Management, our specialists and technologies offer relevant and timely assistance wherever you need. www.lexicode.com LexiCode, an Exela brand company, provides innovative HIM solutions from remote coding support to full audit services. www.moxehealth.com Moxe Health solves communication for clinicians and payers so they can collaborate in real time. They automatically send the clinical information needed for risk adjustment, HEDIS and Star ratings, claims denial management, HCC reconciliation, ADT notifications and care gap management. Other solutions dodge interoperability or multiply human error, putting the problem off for the future; Moxe solves it. www.mrocorp.com MRO empowers healthcare organizations with proven, enterprise-wide solutions for the secure, compliant and efficient exchange of Protected Health Information (PHI). These solutions include a suite of PHI disclosure management services comprised of release of information, government and commercial payer audit management and accounting of disclosures. MRO’s technology-driven services reduce the risk of improper disclosure of PHI, ensure unmatched accuracy and enhance turnaround times. 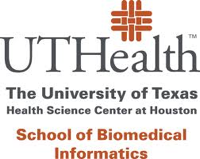 www.sbmi.uth.edu/ The School of Biomedical Informatics (SBMI) is one of six schools at The University of Texas Health Science Center at Houston (UTHealth) located in the Texas Medical Center—the largest contiguous medical center in the world. SBMI is the only free-standing school in the nation dedicated exclusively to graduate programs in biomedical informatics and is the only academic program of its kind in Texas. SBMI’s mission is to educate future scientists and professionals in biomedical informatics and health information technology, conduct informatics research to improve health care and advance biomedical discovery, and develop advanced informatics tools to solve problems in health care. www.tracesecurity.com TraceSecurity is a leading provider of cybersecurity and compliance solutions that help organizations of all sizes reduce the risk of cyber breaches and demonstrate compliance. TraceSecurity offers a comprehensive portfolio of solutions that allow organizations to manage their information security program and supplement it with third-party validation and testing. TraceSecurity’s suite of information security services includes IT risk assessments and audits, social engineering, penetration testing, and security training. With market experience that spans over 2,500 customers, TraceSecurity offers the insight, products, professional services and partners to support the security and risk management efforts of organizations of all sizes across all industries. www.yes-himconsulting.com YES HIM Consulting, Inc. is a premier Health Information Management (HIM) coding and auditing consulting firm with HIM coding credentialed employees serving a variety of clients nationwide. Our team members average 20+ years of experience in HIM coding and hold numerous credentials including RHIA, RHIT, CCS, CCS-P, CPC, CDIP and PMP.